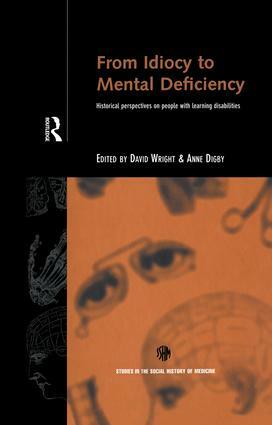 From Idiocy to Mental Deficiency is the first book devoted to the social history of people with learning disabilities in Britain. Approaches to learning disabilities have changed dramatically in recent years. The implementation of 'Care in the Community', the campaign for disabled rights and the debate over the education of children with special needs have combined to make this one of the most controversial areas in social policy today. The nine original research essays collected here cover the social history of learning disability from the Middle Ages through the establishment of the National Health Service. They will not only contribute to a neglected field of social and medical history but also illuminate and inform current debates. The information presented here will have a profound impact on how professionals in mental health, psychiatric nursing, social work and disabled rights understand learning disability and society's responses to it over the course of history.